Chief Minister Virbhadra Singh said that Major Dhyan Chand Memorial Hockey Tournament under 25 boys would be organised at Indira Sports Stadium Una, in the first week of September next, where Astroturf hockey field had been completed. He said that this would be the second Astroturf hockey field in the State after Rajeev Gandhi High Altitude Training Centre, Shilaroo in Shimla District. 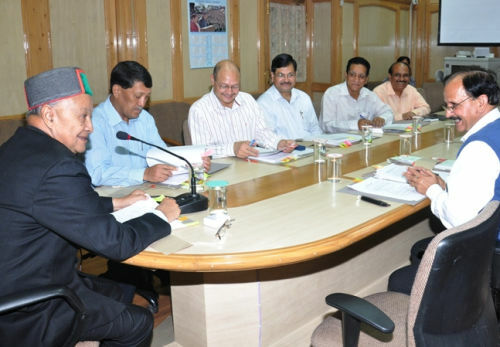 Virbhadra Singh was presiding over the meeting of H.P. Sports Council, here today. He directed the sports department to nominate the eminent sports persons soon in the Sports Council. He said that six students who have scaled the Mount Everest and other outstanding sports persons alongwith special children who had won the medals in National and International Championships would be honoured at State and District level on Independence Day function. Chief Minister said that Sports Associations who are working for the promotion of sports in the State would be given enhanced Grant-In-Aid from Rs. 75,000 to Rs. 1,00000, Rs. 50,000 to Rs. 75,000 and Rs. 35,000 to Rs. 50,000 as per categorization i.e. A,B & C. He directed that a shooting range should be established in Shimla at the earliest in order to provide best facilities for the shooters of the State who are bringing laurels to the Country and State in National and International Championships. Principal Secretary to Chief Minister and Youth Services and Sports (YSS) V C Pharka said that the Sports Department had completed the formalities to provide double cash prize to the outstanding players of the State as per Chief Minister’s budget announcement. He said that the Department was organising International Paragliding Championship Category-II and Open Himalayan Championship at Bir Billing in Kangra District in the month of October at his own this year as per previous year. He said that the Department had hosted the popular Dr. Y.S. Parmar Volleyball Tournament at Shimla. He also apprised that the Department is organising tournament for special children at Kullu this year. Principal Secretary Finance Dr. Shrikant Baldi, Director Higher Education Dinkar Burathoki, Director Physical Education, HPU Ramesh Chauhan, Joint Director YSS Suman Rawat, Deputy Director, Sports Authority of India Ajeet Singh, Zonal Director Nehru Yuva Kendra (NYK) H.P. Dr. Khalid Hasan Khan, District Youth Coordinator NYK Shimla Prabhat Kumar were also present in the meeting among others.